Although seemingly healthy and normal by all appearances, there are people in our wonderful world who unknowingly have a potentially deadly cardiac condition. Most of these people are unaware that they harbour a potentially lethal problem. This is especially true of children with certain familial types of malfunctioning ion channels of their heart cells. Many of these persons die spontaneously from a deadly arrhythmia or fatal myocardial infarction. Their loved ones and friends are shocked, disbelieving, and grief-stricken. This tragedy occurs daily! Yet, there are telltale signs that are conspicuously evident on their EKG or cardiac monitor that reveal these conditions, long before significant symptoms appear. These lives can be saved. If you look for the signs, eventually you will identify potential victims ... and preserve a life. Sometimes the etiology of deadly arrhythmias is but a tiny strip of conductive tissue only millimeters long. However, once discovered, a relatively simple procedure can correct it permanently. Similarly, certain coronary artery pathology may produce few initial symptoms, yet cause a spontaneous life-threatening myocardial infarction without warning. Fortunately, if detected early, this problem can be effectively corrected; truly a ticking time bomb if not discovered - and treated - in time. It is important that all medical professionals are aware of these signs, whether you meticulously interpret or merely observe EKG's and cardiac monitors. Some time in your career you will have the satisfaction of preserving a meaningful life by your attentiveness to detail. You will be the focus of your patient's gratitude, and a hero to their family and friends. You will truly deserve it! Even if these dangerous conditions are not detected early, many of these persons will mature into adulthood, only to suffer sudden cardiac death as their first "symptom." These potential tragedies have universal implications. By being knowledgeable and observant, you can prevent a needless, premature demise. It is easier than you might think. You need not be an expert in electrocardiography in order to save lives. If professionals who come in contact with cardiac monitors and EKG's would routinely look for certain obvious EKG signs, many people would be saved from an untimely death every year. Regardless of your expertise and level of education, you should look for the following - easily identified - electrocardiographic signs of impending (life-threatening!) problems, even in apparently healthy persons. This presentation should have downloaded by now. If not, please be patient, it contains valuable information for you. In fact, someone's life may depend on it. The atria contract, pumping blood into the ventricles just before ventricular contraction. The electrical current ("depolarization") that causes atrial contraction is conducted very slowly to the ventricles to allow time for blood to fill the ventricles. The AV Node, the only electrical connection between the atria and the ventricles, conducts the depolarization impulse (from the contracting atria to the ventricles) very slowly. This provides a brief pause for ventricular filling after atrial contraction. On EKG, the P wave (representing atrial contraction) is normally followed by a short span of level baseline (pause) before the QRS complex (ventricular contraction). From Rapid Interpretation of EKG's copyright © 2017 COVER Publishing Co. Inc. In some people, an anomalous conduction pathway, the "Kent bundle," connects the atria and the ventricles, short-circuiting the AV Node. The anomalous conduction pathway allows rapid conduction to the ventricles without the normal delay. This produces Wolff Parkinson White (WPW) syndrome, which is characterized by conduction of the atrial depolarization current to the ventricles immediately after atrial contraction. On the EKG of patients with WPW syndrome (see page 171, 6th ed. ), the usual short span of baseline following the P wave is replaced by a curving "delta wave," representing too-early stimulation ("pre-excitation") of a portion of the ventricles. This is easy to detect in most leads as a gentle upward curve that connects the P wave and the QRS complex. Pre-excitation of the ventricles, per se, is not serious, but it may lead to rapid ventricular rhythms that are dangerous, particularly in elderly persons or those with heart conditions. WPW is very treatable; the Kent bundle can be ablated (destroyed) using a radio frequency intracardiac catheter. Therefore, early detection of delta waves on EKG can allow these patients to enjoy a normal life span. Brugada syndrome is a recently recognized cause of sudden death in apparently healthy individuals. It is responsible for about one-half of sudden deaths in young persons without structural heart disease, therefore early detection is critical. This familial condition is due to malfunctioning sodium (Na+) channels in the heart cells. Although the deadly arrhythmias (abnormal rhythms) that victims experience cannot be prevented, they can be successfully treated with an Implantable Cardioverter-Defibrillator (ICD), which corrects the arrhythmia immediately upon its occurrence. But persons with this syndrome must be identified in order to provide this life-saving treatment. On the standard EKG, there is usually a short segment of level baseline ("ST segment") immediately following the (normally narrow) QRS complex. The ST segment is normally level with the baseline in all EKG leads. However in Brugada syndrome (see pages 268, 310, 6th ed. ), the QRS is widened and has two upward peaks in (chest) leads V1 and V2, and the ST segment is elevated. The ST segment begins at the second peak of the widened QRS then slopes gradually downward. In Brugada syndrome, lead V3 also has a wide QRS and ST elevation that is stereotypical for this condition. All medical personnel who frequently observe cardiac monitors or EKG strips should make a mental note of this EKG pattern. If you keep a mental reference of the EKG morphology of Brugada syndrome in leads V1, V2, and V3, perhaps you can prevent an untimely, unnecessary death. Since lead MCL1, which is a variation of leads V1 and V2, is the most common lead used for cardiac monitoring, all medical personnel should be familiar with the EKG morphology of this deadly syndrome. During your career you can prevent an untimely death by referring your patient for proper life-saving treatment. Rarely are we warned of an impending myocardial infarction long before it occurs. However, in patients with Wellens syndrome, stenosis (narrowing) of the Anterior Descending (the most important) branch of the Left Coronary Artery is revealed on EKG in patients with negligible or even absent symptoms. Therefore it is important the all medical personnel be ever-vigilant for the telltale signs of this important syndrome. On normal EKG's the T wave (which follows the ST segment) is usually upright or somewhat flattened in leads V2 and V3. However, in the EKG of some patients with stenosis of the Anterior Descending coronary artery, the T waves are markedly inverted (upside down) long before symptoms are present. For those patients with Wellens syndrome (see pages 265, 310, 6th ed. ), this easily detected EKG sign is life-saving only if the person(s) observing the EKG are savvy enough to recognize this important problem. Be that person! Stenosis of the Anterior Descending coronary artery is very treatable, and it is important that treatment be initiated before the artery is totally occluded causing myocardial infarction... even death. Using a special expandable catheter placed in the stenosed artery, the narrowed area can be dilated by a cardiologist using a procedure known as "angioplasty." Currently, most angioplasty procedures employ the implantation of a metal mesh tube known a "stent" inside the artery, to keep it open and prevent re-stenosis of this vital artery. Intervention using angioplasty with stenting can indeed be life saving, but your recognition of Wellens syndrome is the critical link. There is a group of familial syndromes collectively known as Long QT syndrome (see pages 28, 158, 310, 6th ed.). There are at least six different forms of Long QT syndrome thought to be caused by dysfunctional ion channels; they all can produce dangerous or deadly ventricular arrhythmias. Early treatment with proper medications should be instituted as soon as this syndrome is detected, ideally during childhood. There are, however, perhaps many thousands of people with undetected Long QT syndrome who require treatment. Although the heart rate varies somewhat (in response to physiological needs), the QT interval (measured on EKG from the beginning of the QRS to the end of the T wave) always remains less than one-half of the cardiac cycle. 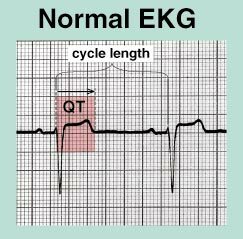 With Long QT syndrome the QT interval is longer than one-half the length of the cardiac cycle (usually measured from R wave to R wave). A quick glance at any lead will reveal the lengthened QT interval. Lengthening of the QT interval can be caused by a variety of medications that block ion channels (usually K+ channels). Certain types of cardiac pathology or metabolic conditions can also lengthen the QT, but in general, lengthening of the QT interval, regardless of the etiology, predisposes the patient to Torsades de Pointes (see pages 158, 310, 6th ed.) and other dangerous arrhythmias. Don't overlook it! If you detect any of these syndromes and refer the patient for treatment, please share your experience with us. Lifesaving measures are not always emergency measures. You can derive just as much satisfaction, pride, and patient gratitude by preventing an untimely demise.